The English stand on thick green grass in special white clothes and hit a small ball with a stick. Just like our tip-cat… If you hit it or, worse, it hits something behind you, someone else takes your place. That’s why it’s called enter-go. It’s hard not see this episode as a canny inversion of the way Central Asia has for so long been an object of the western gaze, all too rarely offered its own voice in the English-speaking world. There is, after all, only so much you can learn about a place from the tales of intrepid travellers like Muborak, as colourful as their accounts may be. Maybe it’s just my impression, but Central Asia, and Uzbekistan in particular, seem to have been gaining increasing prominence in the English-speaking imaginary in recent years. In September 2016, Uzbekistan made the headlines across the western media following the death of Islam Karimov. He was the country’s only president of the post-Soviet era – his regime had lasted more than two decades – and it was he who forced Hamid Ismailov, author of The Devil’s Dance, into exile. These events seem to have spurred on the publishing industry, which has started taking a greater interest in the region’s rich history and culture. Efforts by a number of historians and academics to recalibrate our view of history in order to make space for the important role of Central Asia have seen the publication of Peter Frankopan’s Silk Roads, and a few years earlier Frederick Starr’s Lost Enlightenment: Central Asia’s Golden Age (both from 2015). Central Asia even seems to be making its mark in the booming industry of food writing. So far, however, the growing interest in the geopolitical, historical, commercial and indeed culinary value of Central Asia seems to have made little impact on the literary realm. English-speaking readers are likely to have encountered Central Asia, if at all, in works of non-fiction by a posse of privately educated, white, male British adventurers, from Robert Byron and Fitzroy Maclean, to Peter Hopkirk and Colin Thubron. Muborak’s mirror images, you might say. I would not want to downplay the significance of any of these writers, and their books are well worth reading, but surely a region with a history and literary tradition as complex and rich as that of Central Asia has more dimensions than we can expect to find in the writing of such a homogeneous group. Sadly, few works of fiction which might open up these other dimensions for English-speaking readers have yet been translated, especially from languages other than Russian. If we want to move beyond a kir-ket understanding of the region, to penetrate further into the Central Asian soul, new translations may be our best way forward. Fortunately, thanks to the combined efforts of Hamid Ismailov, Donald Rayfield and Tilted Axis Press, there is now one more such translation within our grasp, and what a book it is. The Devils’ Dance is the first of Ismailov’s Uzbek novels to be published in English, and there could be no better testament to what we’ve been missing. In fact, in some ways testament seems an appropriate word for this book. The novel begins with its hero, the great Uzbek writer Abdulla Qodiriy, being arrested by the Soviet police at the height of the Great Terror in 1937. It will come as little surprise to anyone who knows the tragic history of this writer, or of the Great Terror itself, that neither release nor reprieve are on the cards. From this point on the book bears witness to Qodiriy’s final creative act, as Ismailov imagines his hero attempting to (re)construct the novel he had been planning to write before his arrest. A novel that he claimed would have eclipsed all his previous works. In paying homage to Qodiriy’s unwritten novel, Ismailov’s work serves as a testament to the author himself, but it also bears technicolour witness to centuries of Uzbek and Central Asian literature. Readers who are unfamiliar with the creative output of this part of the world will find in The Devils’ Dance an almost encyclopaedic glut of authors and works born of this impeccably irrigated literary landscape. These include Qodiriy’s contemporaries like Cho’lpon, the pen name of Abdulhamid Sulaymon, who was the first man to translate Shakespeare into Uzbek, and Abdulrauf Fitrat, the multilingual modernist writer from Bukhara, both of whom shared Qodiriy’s tragic fate. They in turn share pages with many of their predecessors, including the great Uzbek poets Mohlaroyim, pen name Nodira, Jahonotin Uvaysiy, and even Mughal poets such as Zeb-un-Nissa, themselves descendants of the Central Asian Timurid dynasty. Going back further still, Alisher Navoi, possibly the most iconic figure in Uzbek literary history, is for me a key presence in the novel. Though used sparingly, his words get to the essence of events like few others. It might not be too much of a stretch to say that he serves as the antithesis of the other epoch-defining figure that lurks behind the text: Stalin – but more of him later. “It’s a strange problem, isn’t it: if you stretch out your leg in Herat, you touch a poet’s backside,” says Navoi, in a quote Ismailov takes from the Babur-nama by Babur, the first Mughal Emperor. The literary riches of The Devil’s Dance are, quite simply, every bit as tightly packed as those of Navoi’s Herat. I do not want to give the impression, however, that The Devils’ Dance is just a rehashing of Uzbekistan’s literary heritage, or that its only importance lies in it being one of very few Uzbek novels available in English, though either of these would in themselves make it a work of value. In a recent interview with his publisher Tilted Axis, Ismailov says that having the novel translated (he first wrote it several years ago) prompted him to think about why he had written it in the first place. He feared it might have been a case of “literary hooliganism,” an attempt to muscle in on the style of his literary heroes. Indeed, as I read the book I could not help but think of Borges’ ‘Pierre Menard, Author of the Quixote’, published just 6 months after Qodiriy’s death. In Borges’ typically absurd story, Pierre Menard sets out to reproduce Cervantes’ Don Quixote word for word, not by copying it, but by rewriting it from scratch. Ismailov certainly evokes the world of the 19th century Central Asian khanates every bit as convincingly as Menard’s facsimile, had he managed to complete it, would have Cervantes’ 17th century Spain. Yet, while Menard takes on “the mysterious duty of reconstructing literally [Cervantes’s] spontaneous work,” Ismailov’s undertaking is really a very different one. Though it may take its name from one of Qodiriy’s early short stories, and its inspiration from his lost novel, The Devils’ Dance is every bit Ismailov’s own work. Whenever he writes a new novel, Ismailov claims to reinvent his writing style entirely, and with The Devils’ Dance this is certainly in evidence. It is a dizzying, mesmerising and deeply original work, which weaves its way, in a pattern as intricate as any Uzbek ikat, between Qodiriy’s squalid cell and the various harems to which Oyxon, the hero of his unwritten novel, is confined. The parallels between both worlds are manifold, which must be why Ismailov is able to blend them together so seamlessly. It is also why the work has such a disorientating quality at times, as one world melts into another, and dreams drip into reality. The Soviet prison and the harem are both claustrophobic, oppressive spaces, where no one can be trusted and the threat of violence hangs constantly in the air. And yet both Qodiriy and his heroine Oyxon achieve some form of escape and respite from their circumstances through the opportunities afforded by language, and specifically the spoken word. Early on in the novel, Qodiriy expresses his certainty that “if he had found a collection of Oyxon’s poetry, it would have been acknowledged as the most powerful ever written by an Uzbek woman.” Ismailov is a poet himself, and the text’s 19th century strand is shot through with verse. It is through this poetry that Oyxon and her fellow prisoners perhaps come the closest to achieving the freedom denied them in all other aspects of their lives. Nodira, another hapless wife and mother of the Emir, “could confide the pain and the misery that had befallen her only to Kokand paper,” while in what may be her darkest hour, as she dissolves into alcoholic despair, Oyxon exclaims: “I’m living in a poem.” Qodiriy, meanwhile, finds rays of light in the conversations with his cellmates, from the worldly Muborak and the learned Russian Professor Zasypkin, to the Afghan Mulla Shibirg’oniy and Laziz-zoda, the former Communist party activist who shocks Qodiriy with his knowledge of Uzbek history and literature. Qodiry gradually absorbs these companions, and the stories they tell him, into his imagined novel; a novel into which he increasingly retreats as his fate draws nearer. This retreat into fiction is both a mercy, sparing him form the horrors of his circumstances, and a sad symptom of a reality which no longer seems inhabitable, both inside and outside the prison cell. I’ve realised how few truly Soviet novels there are… For the main part, Soviet literature now seems to me to have been made up of lots of little artificial reservations or theme parks: Uzbek novels, where all the characters – apart from a few token Jews or Georgians – are Russians […]. It’s all a far cry from my own experience of Soviet life. In drawing with great subtlety upon the linguistic variety around him, Ismailov succeeds where so much of Soviet literature failed. When Qodiriy’s house is searched at the beginning of the book, he hears someone speaking Uzbek “like a Tatar, replacing all his ‘j’s with ‘y’s”, while Muborak’s Bukharan accent means that “his statements sounded more like questions”. Qodiry is particularly spellbound, meanwhile, by the language of professor Zasypkin, whose Uzbek, replete with Russian loan-words, sounds like “falling rain and rarefied air”. These observations offer a fascinating window into the linguistic complexity of this part of the world and were for me one of the book’s greatest pleasures. The Uzbek language certainly is odd. You can hide yourself as a pronoun at the end, but that’s also where the emphasis lies: it is marked. But if we look at the language of Navoi or Babur, which was influenced by Farsi, we find pronoun and predicate changing places, all much earlier than the Russian influence. Abdulla’s thoughts reverted to Professor Zasypkin’s narrative, or, to be precise, if one committed sacrilege, to Zasypkin’s narrative reverted the thoughts of Abdulla. Elsewhere, Rayfield resists the urge to over-explain, leaving ambiguity in all the right places, in moments when protagonists – and the reader along with them – struggle to find the essence of one another’s utterances. All of this is even more astounding given that he took on this translation with “little Turkish and less Farsi”, relying on Uzbek-Russian dictionaries, the internet, and the close collaboration of the author to gain access to the text. A lot of people in the world of literary translation have strong opinions about the very specific experience or knowledge of the source language a good literary translator must have, but this book, I believe, shows that the most important skill is the ability to produce a good translation using whatever tools are at your disposal. The Devils’ Dance, then, is many things: it is a testament to Uzbekistan’s literary past, both recent and distant; it is a metafictional slalom; it is a novel of suffering and of the power of literature; it is a rich and original evocation of the intrigues of the Great Game and the Central Asian Khanates; and it is an important contribution to the landscape of translated literature in English. But as well as all of this, The Devils’ Dance is a novel of Stalinism. Stalin, after all, is the novel’s great villain, though he is rarely mentioned by name. “Uzbeks,” we are told, “have a custom of never calling a scorpion a scorpion.” All the same, it is because of him that Qodiriy’s book was never written, and it is he who has all around “eating each other’s flesh.” Many novels depicting the Stalinist era, of course, have been translated into English, with Aleksandr Solzhenitsyn being the archetype for such writing. Indeed, I could not help thinking of one of his works as I was reading The Devils’ Dance. Though it is set after Stalin’s death, Solzhenitsyn’s Cancer Ward is a book that, like Ismailov’s, examines the insidious impact of his regime on the morality of the society over which he ruled. It also has a similarly claustrophobic setting, largely playing out in the eponymous cancer ward, where the suffering patients, from across the Soviet Union, unpick their pasts in the aftermath of Stalin’s rule. And, of course, it is set in Uzbekistan, something I’d forgotten until The Devils’ Dance brought it back to mind. Yet for all this, Cancer Ward is, fundamentally, a Russian novel, with a thoroughly Russian perspective. Ismailov renders the experience of Stalinism in the Soviet periphery in a refreshingly new way. One Russian author who may have come closer than any other to writing a truly Central Asian novel of Stalinism is Andrei Platonov. Though it shares little with The Devil’s Dance in terms of subject matter and tone, Platonov’s Soul, I would claim, is a better point of comparison for Ismailov’s book. Like The Devils’ Dance, it is a Stalin-at-a-distance novel, and one which gets to the heart of Central Asia like few others available in English. Despite being written by a Russian, Soul is nevertheless recognised as one of the great Central Asian novels, including by Ismailov himself. But with the Soviet Union now well and truly gone, we can no longer expect the Russian language to bear the burden of Central Asia’s literary representation. None of this is in any way a criticism of Russian literature, about which, as a Russian translator, I am incredibly passionate. It is simply to suggest that if we are to come close to understanding the Stalinist period, we need to consider it through the lenses of other languages and cultures, with different frames of reference and new vocabularies to express the suffering it inflicted, and the lives of those that bore it. I will conclude by returning to the words of Qodiriy – Ismailov’s Qodiriy, that is: “You could not make literature out of meaningless death. Death had to interact with life,” he reflects towards the end of The Devils’ Dance, and of his own tragically short existence. These words seem very apt for a novel which shows clearly the extent to which the language, literature and defiant spirit of Abdulla Qodiriy’s generation of Uzbek writers still have so much to offer, not just to their own country, but to readers across the globe. In spite of Stalin’s best efforts, their deaths can still affect us, and their work lives on in writers such as Ismailov, whom they continue to inspire. 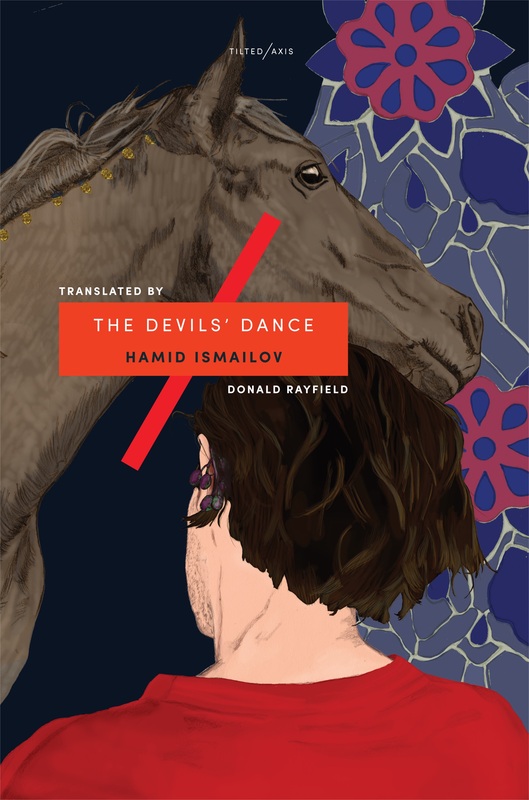 Discussing The Devil’s Dance, Ismailov has said that given the dire state his country finds itself in today, he “felt that perhaps people needed some light.” Despite the tragic story at its heart, there is no doubt that The Devils’ Dance is a ray of light. Thanks to this excellent new translation, this light has now been reflected beautifully through an English prism. The most well-known is probably Samarkand – Recipes and Stories from Central Asia. Find out more here and here.